The key is to start early! Our Chinese program is created and implemented by a native Mandarin Chinese speaker (Mandarin is the official language of China) and is rooted in extensive pedagogical experience. 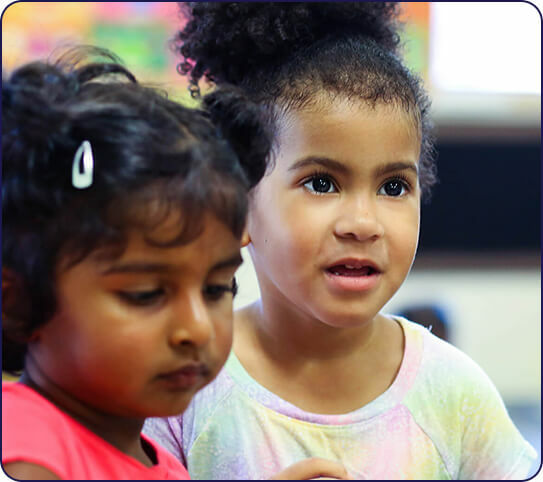 The goal is to make learning enjoyable, so the program is implemented concurrently with playtime, circle time, and other opportunities that make learning fun. 0–12 Months – The first year’s focus is sound. Infants will listen to children’s songs in Chinese and will be introduced to very simple words. This helps to familiarize them with the sound of the Chinese language. 12–24 Months – During the second year, basic sounds are linked to the words they represent. Children are introduced to Chinese picture books and simple language. 24–36 Months – The third year helps children enrich their vocabularies and learn the most basic principles of grammar. Chinese words and greetings are incorporated into day-to-day activities. 3–4 Years – At this stage, children continue to increase their vocabularies. As fine motor skills develop, writing is also introduced through tracing Chinese characters. Children will also learn through games, art, stories, and songs. School Age – Children will continue learning both spoken and written Chinese. Teaching plans are based on age and level of fluency. Interested in signing your child up for our Chinese program? Find a center near you to learn more about putting your child on the fast track to valuable language skills!